A recent study by Kenneth Hansraj has shown the effects of posture and head position on the load on the neck muscles. When in good posture, the head rests over the shoulders, placing about 10-12 pounds of force on the neck. That’s basically the weight of the head pushing straight down on the spine. But postures that force us to hold our heads forward, like when working at a computer, sending an e-mail from our phone, or replying to that “oh-so-important” text message that we just received, place much higher forces on the neck joints and muscles. 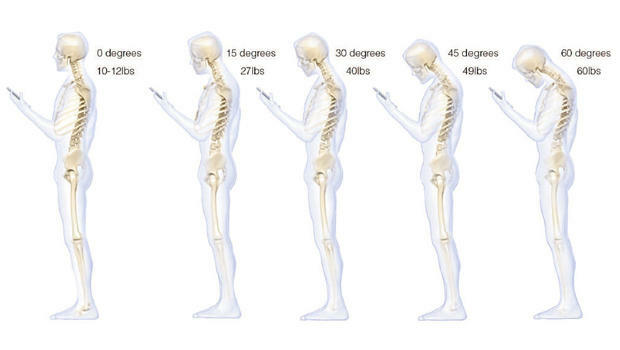 As the neck moves forward of the shoulders, as when we are looking at our smart phones, the neck muscles must work much harder to lift the head back up. What’s worse is sustaining that position, which forces the muscles to hold that tension for as long as the head is held there. Many people currently spend an average of 2 to 4 hours with the neck bent forward in this unnatural position. Bending only 15 degrees forward causes the muscles to have to work at 27-pounds of force. That is more than double the weight of the head when it is over the shoulders. The numbers just get larger the farther forward the neck bends; 30-degrees forward effectively weighs 40-pounds, and 45-degrees forward increases the workload to 49-pounds. At 60-degrees forward bend, the neck muscles have to pull with 60-pounds of force to hold the head. How far forward is 60-degrees? You’re probably there right now if you are reading this with your smartphone near lap level! Optimal posture has the head held so that the ears are aligned with the shoulders, and the shoulders are relaxed down slightly. If you are having neck pain that is persistent, try working on your posture first, especially when using your phone. Hold your phone up higher, nearer eye level to reduce the forward bending of the neck. If the pain persists, the experts at Lifestrength Physical Therapy can help to evaluate other contributing factors, and design an effective plan to resolve the pain and hopefully prevent its return in the future. Call today to schedule an appointment.